Successfully Added USB Multi-Adapter (iPhone, Nokia, Motorola, Blackberry + More) to your Shopping Cart. This USB multi charge cable is a USB data cable and charger that comes with mobile phone and digital device connectors that allows you to recharge all your cell phones, portable gaming and music devices. In addition, to being a USB multi-adapter charging cable for Nokia, Samsung, Motorola, LG, Blackberry, iPhone, iPod, HTC, Palm, Sony PSP and Nintendo DS, it also works as a data cable to allow file transfer between your computer and multiple devlces. The A28 USB Multi-Adapter also allows you to charge multiple electronic gadgets and devices at the same time, making life for today's modern gadget power user easier and more convenient. Connect to the world with these multiple connectors designed for Nokia, Samsung, Motorola, LG, Blackberry, iPhone, iPod, HTC, Palm, Sony PSP and Nintendo DS. This USB multi charge cable (USB charger and data cable) is in stock now and available at a factory direct price straight from the leaders in wholesale electronics, Chinavasion. 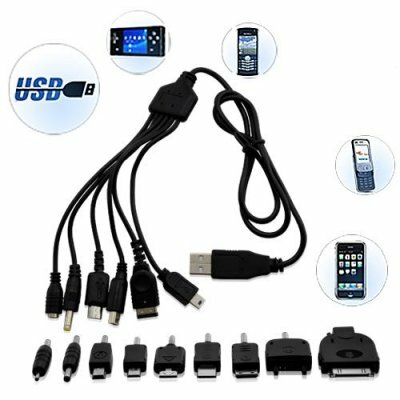 Will this USB Multi Charge Connectors for Nokia, Samsung, Motorola, LG, Blackberry, iPhone, iPod, HTC, Palm, Sony PSP and Nintendo DS charge my Dingo game player? Yes, you can charge your Dingo player and any other player media player, cellphone, electronic gadgets that connects using one of the following adapters or supports a Mini USB port. Will iPhone 30 PIN connector also work on the iPhone 3Gs? Can I Charge more than one cellphone at the same time? Yes, you can connect more than one cellphone or electronic device and charge several gadgets simultaneously.